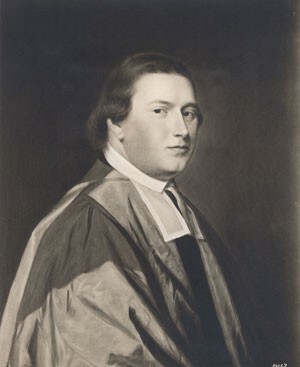 An Anglican minister and Oxford University graduate, Myles Cooper, under the recommendation of the Archbishop of Canterbury, was appointed professor of moral philosophy and assistant to the president in 1762. A year later, following the retirement of Samuel Johnson, Cooper was appointed president. At age twenty-six, he remains the youngest person to hold this position in Columbia's history. Under his leadership the wealth and prestige of King's College was increased and much of the academic formality of Oxford University was instituted. Students were required to wear cap and gown in public on all occasions, diplomas were awarded for degrees conferred, and all rules of discipline were more rigidly enforced. Under Dr. Cooper, the curriculum was revised and enlarged, and in 1767 the King’s College medical school was established - the first in the country to grant the M.D. degree. Cooper’s students included notables such as John Jay, Alexander Hamilton, Robert R. Livingston, Gouverneur Morris and Egbert Benson. In May 1775, the outbreak of hostilities between the British and the colonists forced Cooper, a well-known loyalist, to seek refuge aboard the HMS Kingfisher in the New York Harbor. Ten days later he sailed for England where he lived comfortably for the remainder of his life.